Critically-acclaimed writer Jody Houser (Mother Panic, Faith, Orphan Black) steps into the iconic world of James Bond in an all-new miniseries, authorized by Ian Fleming Publications Ltd, centering around the character's friend, confidant, and former MI6 field agent, Moneypenny. 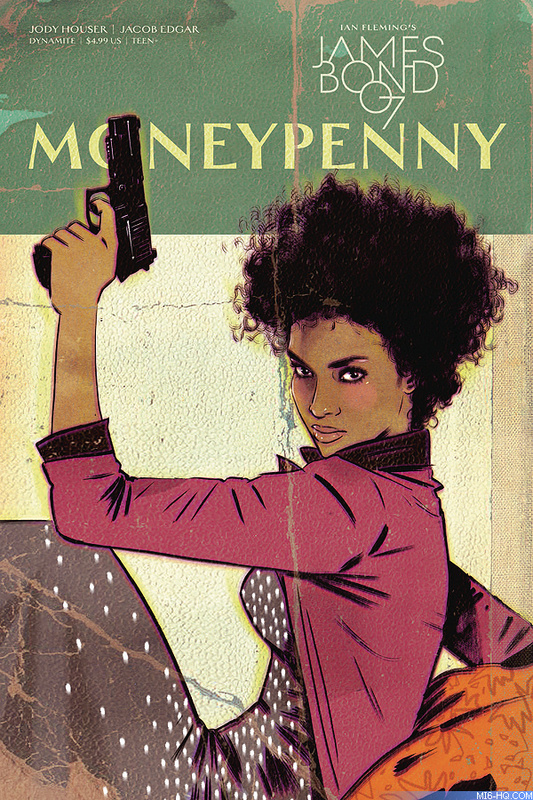 Houser, who will become the first female writer to take tackle the Bond universe in comic book form, will be joined by up-and-coming artist Jacob Edgar for Moneypenny's first-ever dedicated tale of adventure in James Bond: Moneypenny! Hitting stores August 30th, James Bond: Moneypenny focuses on what was intended to be a ‘routine' protection mission for Moneypenny, until she uncovers a complicated assassination plot that bears a striking and unsettling resemblance to a tragic, and life-changing terrorist attack from her childhood. In the face of imminent danger, will Moneypenny be able summon her secret agent skills to stop the impending plot before it's too late? Writer Jody Houser says, "As someone who came to James Bond late (much to the horror of many of my friends), the idea that I'd get to play in that world is amazing. Writing a character like Moneypenny and exploring what makes her different from the more familiar MI6 operative has been a blast. In this story, we'll get a look at exactly how she operates and some of the events that made her the woman she is." Houser earned an MFA in Creative Writing at Emerson College in Boston, where she completed her master's thesis in screenwriting and was a winner of the Rod Parker Fellowship for Playwriting. Starting in 2006, Houser began experimenting with webcomics, and in 2010 debuted the popular Cupcake POW!, before going on to work with a number of the top industry publishers to write some of her most successful titles including Mother Panic, Faith, and Orphan Black. "We're excited to launch James Bond: Moneypenny and bring a fresh, new voice to the Bond universe," says Nick Barrucci, CEO and Publisher of Dynamite Entertainment. "We've followed Jody's career and have wanted to work with her for quite a big, and this is the perfect project to work with her on. As the first female writer to tackle the comic book world of Bond, Jody is certain to bring new perspective and a fresh take on the iconic characters, while adding that extra touch of class Jody brings to all her works." Moneypenny first appeared alongside James Bond in Ian Fleming's very first novel, Casino Royale, published in 1953. As the personal secretary to M, Bond's boss at MI6, she would go on to play a small role in almost all of Ian Fleming's Bond novels, but did not receive much character development until 2006's spin-off series, The Moneypenny Diaries. In 2015, Dynamite published Warren Ellis' James Bond: Eidolon series, in which Moneypenney is featured as a major character. James Bond: Moneypenny marks the first time the character has received a dedicated story in comic book form! The 40 page special 'James Bond: Moneypenny' will be released on August 30th 2017.